Nothing is so perfectly amusing as a total change of ideas. Anybody that doesn't want to get killed best clear on out the back. Christine Montalbetti is the best shot in town. She'll slay you in the street at high noon. So if tender, easily digestible reads are your favorite, best clear on out the back. Jane Austen or Suzie Ormond, Western ain’t. However, if what gets your blood going is a hard gallop across open space with terrain so changeable you could get thrown if you don’t pay strict attention, well, then Western is your mount. The author of Western is French, a literary critic and theorist, and teaches French literature at the University of Paris. Western was—you’ll need a slug of rotgut whiskey to get this down—written in French. (The translation, by Betsy Wing, corrals the novel superbly in English.) 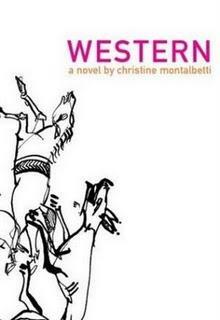 Western is, therefore, nothing like an oater scribed by Louis L'Amour. Well, maybe not nothing. There are genre tropes in Western. For example: a big sky, horses, tumbleweed, a ranch, a street brawl, and a town, called postmodernly enough, Transition City. Imagine these tropes filtered through phenomenology, Roland Barthes, Proust, Laurence Sterne, Jacques Tati, Lucille Ball, and god knows who or what else. The result is that Montalbetti uses and abuses all these tropes pretty much as she does with one cowboy, name of Dirk, who is so laconic it takes him three pages to say nothing. This expansiveness means Western upends what is a terse action genre and becomes hilariously, verbosely literate while making profound observations and asides. Western, therefore, has huge fun decimating its genre, honouring it, while being amazingly intellectually satisfying and wise. The novel also takes a postmodern tack in narrative voice. It employs a first person narrator, a “writer” who speaks directly to “you”, as though we, the reader, were walking beside her as she creates the action and characters. At times, she fades off into a third person omniscient, only to pop up again as "I" just when you’ve forgotten there was a first-person narrator. Many sentences in Western roll, twist, divagate, navigate, hesitate, stumble, detour, and come back on themselves for a page and more. Thank goodness, though some readers may be tempted to throw the book at the wall. Go ahead. You’ll be picking it up in a minute eager to see if the narrative will eventually exit that anthropomorphic ant world you’ve suddenly been dragged into with its hexapod characters’ imaginings—though just a sentence ago another cowboy was rocking on the porch waiting for sunrise. Hexapod characters’ imaginings? Yup. Summing up this book is like trying to sum up life. Instead of trying, here’s an excerpt to give you some idea of the action-adventure you’re in for in Western. Slow down. Savour. This tiny, defiant memory, which distinguishes itself so clearly from the heap of fragile, scarcely sustained subjects briefly popping up in our man’s mind only to disintegrate immediately (those particular subjects would be just as hard for me to catch, in order to show you, as chasing butterflies with a net held out in front of me—picture it—while tripping over lumps of earth pushed up by moles; likely to lose my Lepidoptera if I start paying attention to the ground I’m walking over, but unable to catch anything as I’m falling all over the place), this thought, more vigorous than the others, no longer forming a single long wave along with them, driving its roller onto the beach, this thought, a sturdy residue rather than foam, though still, well, how shall I put it… Me, I put it like this: tour de force.